SW-52EX / SW-52ST can provide alarm outputs for control in the event of an earthquake on gas and dust explosion areas such as petrochemical or hydrogen plants, manufacturing plants, etc. High resolution servo accelerometer enables to prevent secondary disasters caused by earthquakes. Built - in servo type accelerometer is also used for detection of micro-tremor. Both indication setting and alarm setting is 1 gal step. It is ideal to install the seismometer on the common foundation to catch the motion of earthquake correctly. 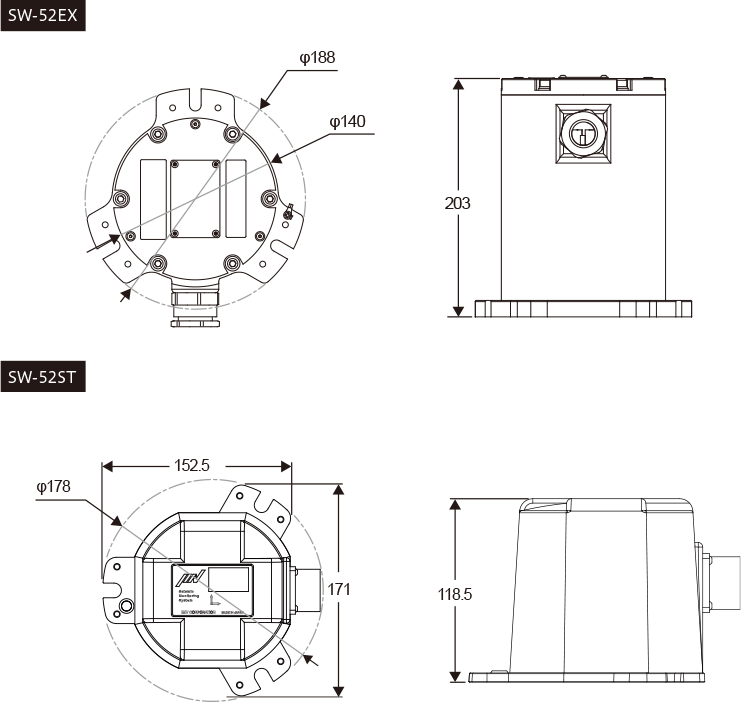 SW-52EX / 52ST adopts IP67 waterproof structure which is able to be installed outside or dusty environments. The peak of motion in any direction can be surely captured by vector composition of the accelerations detected by the accelerometers arranged in three directions. The measurable acceleration range up to 5000 gal prepare against the large-scale earthquake. The container is constructed to withstand the pressure when explosive gas explosion occurs and not to catch fire. Output content : “Seismic alarm” or “FAULT alarm” can be selected. Seismic alarm Alarm is output when the system detects earthquake and the measured value exceeds a preset level. Upper limits of 4 levels (Digital output 1 to 3, Relay output) can be individually specified.